Q: I found a dog! What do I do? We get calls all day long about stray dogs in the area. Planned Pethood can help you with your found dog, but our resources are limited. We are doing what is best for as many dogs as we can and sometimes the one you found isn't in as dire need as another one. While we understand you are focused on the life of this particular dog (and thank you for that), we are focused on the lives of many. Both agencies will assist you in trying to find the owner. If you choose, you may take the dog to the Dog Warden and turn it over to them. If the owner does not come in for him/her, the Dog Warden office will assess the dog. If it passes the assessment and there is space available, the dog will be offered to the public for adoption. The Toledo Area Humane Society will not take in strays. The Toledo Blade will run a free Found ad for four days. Blade Classifieds can be reached at 419-724-6451. Make the ad rather vague so the caller has to prove they are the actual owner and not just a person trying to get the dog for bad reasons. They are out there! Post flyers everywhere around the general location where the dog was found. Take a picture of the dog. More dogs find their homes this way than any other method. For a $25 donation, you can list your fully vetted stray dog on our website and on Petfinder. You can upload a picture and post information about the dog. By doing this, your ad will reach approximately 48,000 people each month. We ask that the dog be completely vetted (spayed/neutered) prior to listing them on our website. Please send us a write up on the dog, your contact information, a .jpg photograph and donate your $25 here. Q: What do I do when I think someone is mistreating an animal? Planned Pethood can't do much to help out in this situation, since we are not a government entity. We have no authority to intercede, but you can! You can call the Cruelty Investigation Division of the Toledo Area Humane Society (TAHS). They can be reached directly at 419-891-9777. You will have to leave a message on their voicemail because they are usually out on the road responding to calls. They do check messages several times throughout the day. When you call, leave the address and zip code where the property is located. Describe the conditions as you see them. Include whether the dog has shelter (according to the law, "shelter" has to be 3 walls and a roof), and if water and food available. The dog has to be in good health and able to reach its shelter, food and water at all times. This is what the state of Ohio defines as acceptable living conditions for a dog. Not what we say or you say is acceptable. The officers can only follow the conditions set by the state guidelines. If you provide the dog with food, water or shelter, the investigators must assume it was provided by the owner and it will end up hurting the effort to save the dog. 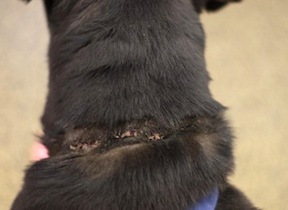 The Cruelty Investigators are employed by Lucas County, but work with the Toledo Area Humane Society. The officer can then talk to the owner, or whomever is at the house, about what is proper and lawful. You do not have to leave your name or number if you wish to remain anonymous. You can leave your name and number asking for an update on the outcome, but ask that they do not tell the owner your name. Sometimes the officers talk to the owner and are able to talk them into signing the dog over to the TAHS. Perhaps in speaking to the owner or harborer of the animal, the officers may at least get the owner to think about finding a new home for the dog, since they are just keeping it outside anyway. We keep our fingers crossed and hope the owners see their way to do the right thing. Q: I need to return my dog. Now what? We always take our animals back into our program to find another home...ALWAYS! It makes us sad though that the dog has been with you for this long and now he has to find a new home. We can help you try to work through any issue you might have. But if you still must give up your Planned Pethood dog, we just need to work out a few things. 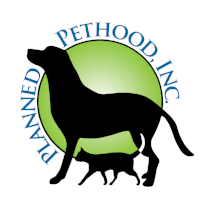 First, notify us at pets@plannedpethood.org. Please tell us the dog's original Planned Pethood name and the date or approximate date of adoption. Please explain in detail your situation and then immediately fax your dog's current vet records to 419-243-1835, attention Laurie. Second, would you be willing to keep the dog while we find another home? This will be less confusing to the dog and LESS STRESSFUL. We also have a shortage of foster homes so it would help us too. Think about your dog and not about your situation. If you can't let us know and we will figure something out. That's another reason why we need your dog's vet records. If we have to board the dog, we must be able to prove he/she is up to date on vaccines before any facility will let a dog stay. Third, please send a recent digital photo of the dog to pets@plannedpethood.org along with a write up. We can place this on our website and list on Petfinder to expedite getting the dog into a new home. You can read some of the other write ups we have online on our Dog page. That will give you an idea of what to write about. And we want to know everything, both good and bad please--no sugar coating as it just means more hardship on your dog. Fourth, now is the time to be honest with us. Are there any behavior issues the dog has that we need to know about? How is the dog with kids? Other dogs? Cats? Is the dog housebroken? Destructive? Does the dog jump fences? Tend to run away? We need to know so the foster can start working with him/her immediately and get the dog to a trainer, if need be. If we get the over-the-top nice version, we basically waste time trying to figure out why a dog that we were told was perfect is less than. Again, it makes it harder on the dog in the end. Q: I need to find our current dog a home. Help me! Planned Pethood accepts dogs into our adoption program that were not adopted previously through our organization. Now, the best situation for the dog is to have it remain in your home while we find a forever home for him/her. It can be traumatic moving a dog from home to home and we sometimes don't get to see the dog's true personality. A dog accepted into our adoption program that stays in your home until an owner can be found is what we call a Present Owner Foster Dog. Your dog will be listed on our website www.plannedpethood.org and www.petfinder.org. We will screen potential homes to ascertain if they are a good fit for your dog. You get to be part of the process and help select the best home for your dog. Admittance into Planned Pethood's adoption program is contingent upon a few things. 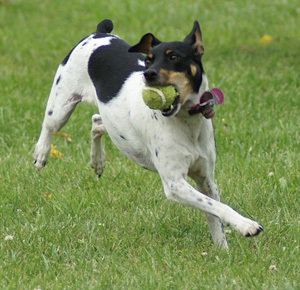 Your dog will need to pass our evaluation for aggression and how it does in a variety of settings. We also need to see a copy of your vet records, which can be faxed to 419-243-1835, attention Laurie. You must also sign a release to say you understand the guidelines and rules for present owner adoptions. Dogs that attend adoption events get adopted MUCH faster than those that are just on the website. Try to make every adoption event you can. We will also help you meet with people and help you during the process. Dogs that are accepted to participate in the Present Owner adoption program MUST be adopted through Planned Pethood's adoption process. If we cannot help you at the time of your request because we are full, we ask that you contact rescue groups in our area or try the Toledo Area Humane Society at 419-891-0705 or 1920 Indian Wood Circle in Maumee, OH. NOTE: You should ask any rescue group how they operate, how long your dogs will be in their adoption program, and most importantly, WHAT WILL HAPPEN TO THEM LONG TERM IF THEY DO NOT GET ADOPTED. Another option is our Classified Program. For a $25 donation, you can list your fully vetted dog on our Available Dogs page of our website and on Petfinder. You can show a picture and information on the dog and reach approximately 48,000 people each month. We ask that your dog be completely vetted (spayed/neutered) prior to listing the dog on our website. Send us a write up/contact information on the dog, a .jpg photograph and donate your $25 here. Below you will find plenty of information on how you can find a great home on your own for your dog. It is important that you take your time and not simply give him to the first family that presents itself. And whatever you do, do not place a "Free to Good Home Ad". Please read this information to learn more on how to safely place your own dog. If you have any questions please do not hesitate to contact us. This website contains a database of everyone in the country who has ever been charged with animal cruelty. You are able to search your community to see if any of your friends or neighbors have ever been charged. This is a very useful tool when considering adopters for your dog. If their name is on the list, don't be afraid to tell the person that you are aware of their past abuse of animals and that you refuse to give your dog to them. Q: How does the dog adoption process work? The first step is to fill out an online application that you'll find on our dog page. Your application will be submitted for review. During the review process, we will be making sure you can provide a safe home. We want to make sure the dog is a good fit for your lifestyle. We will also be checking with the dog's foster about the dog's likes and dislikes. If you have a veterinarian, their office will also be contacted. Please contact your vet now and let them know Planned Pethood will be contacting them regarding your past/current animals. This will speed up your adoption process. If your application is submitted during the weekend or a holiday, you may not be contacted until the following business day. If you are submitting an application after 12 noon Friday, we suggest you come to our adoption event early, as your application may not be processed in time for our regular weekly adoption event. Please understand that we are all volunteers. Most of us work, have families and we will get back to you just as soon as we can. If your adoption criteria is met, we will pass your information on to the foster. That only means you have passed through one step of the adoption process. 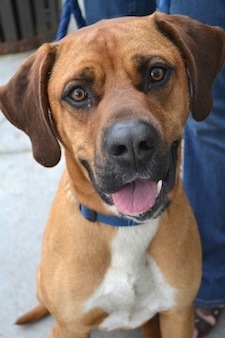 The foster is responsible for contacting you and making arrangements to meet the dog during the week. A Planned Pethood screener must be present if you think you would like to adopt. Please let the foster mom or dad know you wish to have a screener present. Or, you and the foster can agree to meet on Saturday during one of our adoption events. Screeners are always there to complete the adoption. Print off a copy of your completed application and bring it with you. We will also need to arrange for a volunteer to do a home visit. We can do that at any point in the adoption process, but your adoption will not be finalized until it is done. We aren't concerned about your decorating! We just want to make sure your home is a safe and caring place for the dog you're adopting. If you are selected for the dog's adoption, and your home visit is completed, you can take the dog home that same day. We suggest you immediately place an ID on the dog along with buying a dog license. Do that before you leave the adoption event. Many dogs have a hard time adjusting within the first few weeks of adoption and could tend to "flee/jump fences" in attempts to find their foster home again. Vet records will be given to you or mailed to your home within 6 working days. Planned Pethood does not hold dogs. If you are asked for further information you need to provide this to us as soon as possible. If another home has applied in the meantime, meeting all qualifications prior to you submitting the information, the dog may go to the other home. We also do not adopt on a first come, first serve basis. We select the best home. We have the right to refuse anyone a dog, for any reason. We are volunteers. Planned Pethood does not have a paid staff. We all give our spare time to give unwanted dogs and cats the chance to be in a loving, warm, safe home. We run our organization in a professional manner. Please be patient with our response back to you. Q: What if we want to adopt more than one dog? Is there a discount we can get for adopting more than one dog? We see so many we want to adopt! Sorry, no. You see we adopt our dogs out for under the cost of vetting and lose money on almost every adoption. We rely completely on your donations to survive daily to help more. 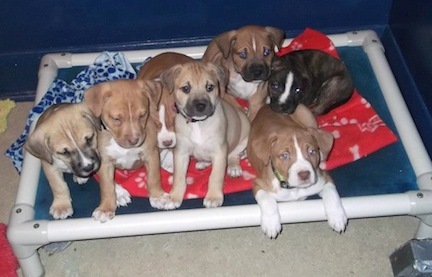 We highly suggest you adopt one dog at a time, especially when it comes to puppies. If you want to adopt two dogs, give it a little time and then adopt another dog. Many people for example adopt two puppies at once only to find out they are not super people with super patience and an abundance of time for training. Hence many times one or both dogs come back to us at 7 months old wild and untrained with the owners expecting us to solve their problems. Some people can do it successfully but you need to be committed...really committed! It's like having two new born babies in your home that want and need constant attention. Before you consider adopting two puppies, we encourage you to read research and articles about why this is not a good idea. Take your time. A dog is a commitment. If you see several on our website that you are interested in, just tell us on your application or write to us at pets@plannedpethood.org. We can talk and find out what kind of lifestyle you have and try to match your family with the dog that will best suit your world. Our foster homes really know their dogs very well and can point you in the right direction for the right dog. Q: We're having "issues" with our Planned Pethood dog. What do we do? First off, don't wait until you are pulling your hair out and are hanging on the cliff ready to jump, EMAIL US! Don't wait until you are ready to "return" your dog!! We can help you! Whether it's biting, excessive urination in the home, jumping a fence, etc. we want to help, let us! We can help you find a qualified trainer. Or if you have money constraints, one of our volunteers that is a trainer can help you. Best results are accomplished when listening and following the trainer's instructions. E-mail us at pets@plannedpethood.org. Q: Pit bulls - can you help one? Yes. Pit bulls are just another breed of dog. Planned Pethood doesn't see them differently, as any other breed of dog. Please refer to Present Owner to Foster or Classified options on this page." You can also look into our classified or Present Owner to Foster options. You are welcome to place a listing on our Available Dogs page of our website. For a $25 donation, you can list the dog with a picture and reach approximately 48,000 people each month. 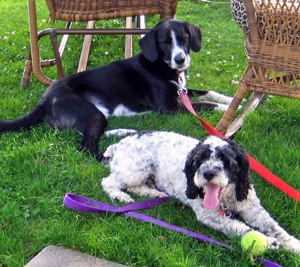 We ask that your dog be fixed prior to listing the dog on our website. If the Pit bull is not fixed, we might also be in the position to help you vet your animal prior to adoption. Send us a write up/contact information on the dog, a .jpg photograph and donate your $25 here. If Planned Pethood has space available for your pit bull or pit bull mix we will require the new owner have all the requirements needed by the state they live in. You can read about those laws here. Q: Do you adopt to us out-of-towners? Sure we do! We still have to do a home visit. This will add more time to the process as we locate a partner in that area to help us. Q: Do you hold dogs? No, sorry. It clogs up foster space and disallows us to continue to save more lives. Even if I pay for it to be boarded until I can take it? No, sorry again. We truly believe these dogs have been through enough and shouldn't be shoved into a kennel until you can come meet the dog. Q: Help! We lost our Planned Pethood dog! First contact us immediately by e-mail at pets@plannedpethood.org. There are many times where many of our volunteers drop everything and help you search for your dog. The first key in getting your dog back safely is by having a dog license AND current ID tag on the dog. Place posters with a picture of your dog EVERYWHERE in immediate area it was lost in and high traffic places like grocery stores, banks. Many locally owned businesses are willing to help you! We have found this is the best way to get your dog back. Send us a picture and information, we'll post it on our website. Call the Toledo Blade classified department at 419-724-2424 and/or your local newspaper and place a LOST DOG ad immediately--don't wait! Offering a reward helps! Call the Toledo Humane Society and report your dog missing in case someone tries to turn in the dog there. Call your local dog warden. Go to the dog wardens daily and search for your dog. Give the dog warden and the Humane Society a poster too. Toledo Area Humane Society can be reached at 419-891-0705. The Lucas County Dog Warden can be reached at 419-213-2800. Q: What is wrong with giving puppies or my dog(s) away free in the newspaper or by postings? 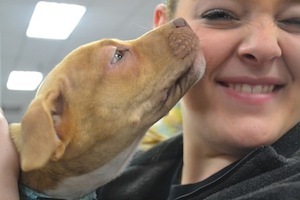 Responsible people are more than willing to pay to adopt a dog or puppy from a reputable rescue group, particularly one that spays/neuters prior to adoption. These are the type of people you want providing loving homes for your dog or dog's puppies. People who are looking at "free puppies/dog" ads usually are financially challenged and do not provide vet care or spay/neuter for their new pets. In addition, many of these "free puppies" end up as live feed or as bait for fighting dogs (don't take their word the puppies will get good homes--they look like "normal" people). We are often told that it's got to be a good home if there are children involved which is not always the case at all. The so called "free puppies and dogs" are usually the ones that are eventually sent to the pound after the owners have tired of them. Q: Is there anything I should know when considering the adoption of a pit bull type dog? We have set up a special page about the laws and helpful hints for owning a pit bull type dog in Ohio and/or Toledo. You can read all about it here. Q: Are there any special requirements to be a dog owner in the City of Toledo? Yes, there are special laws beyond those of the Ohio Revised code for any dog within the Toledo city limits. These laws cover barking, tethering dogs outside, leaving a dog alone and how a dog is defined as a public threat to safety. The ordinance also outlines penalties, broken down into different levels of threat. You can read the Toledo ORD 389.10 by clicking here.